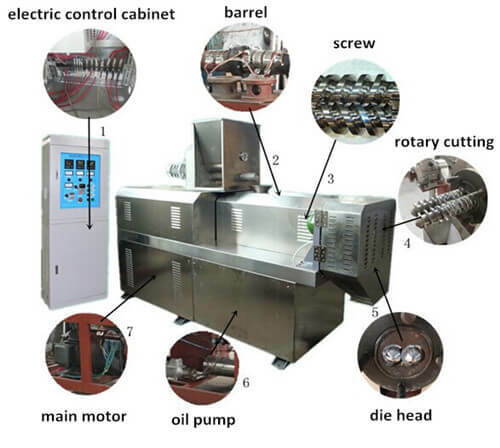 Twin screw food extruder is mainly designed for making puffed food. 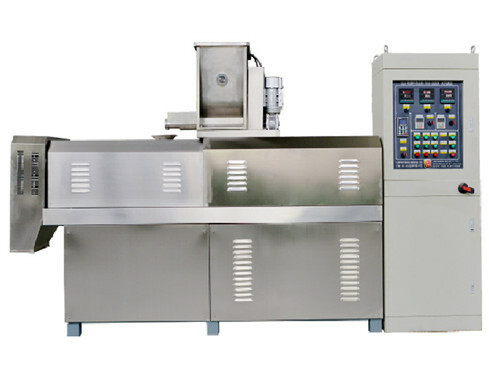 It is developed on the basis of the single screw extruder. In the cylinder of the double-screw extruder, two screws are placed side by side, so the twin screw extruder is called. The emergence of double screw extruder has replaced the traditional single screw extruder with low efficiency and cumbersome operation. It has rapidly become the mainstream product of extruders market. Through the twin screw extruder, the raw materials which are rice, corn, soybean, and wheat in daily life are extruded and then formed into triangular, circular, hexagonal and cartoons by rolling or stamping. Later all kinds of flavors can be produced by frying, baking or flavoring. The most obvious feature of the puffed food is its large size. 1. According to different raw materials and products, the building block combination screw can be freely combined. 2. Barrel equipped with water injection device, better adapt to the raw materials and quality requirements. 3. A variety of feeding modes and feeding units can realize the measurement and quantitative addition of various materials. 4. Electric motor and distribution box direct drive, less energy loss. 5. Linear bearings knife, safe, accurate and fast. 6. Adopting the imported bearing group, the bearing capacity is strong. 7. Automatic circulation cooling system can control temperature precisely. Puffed food has many brands, kinds, and tastes. Many people like it, especially children. Puffing food machinery can process rice, corn, soybean, and wheat in daily life. 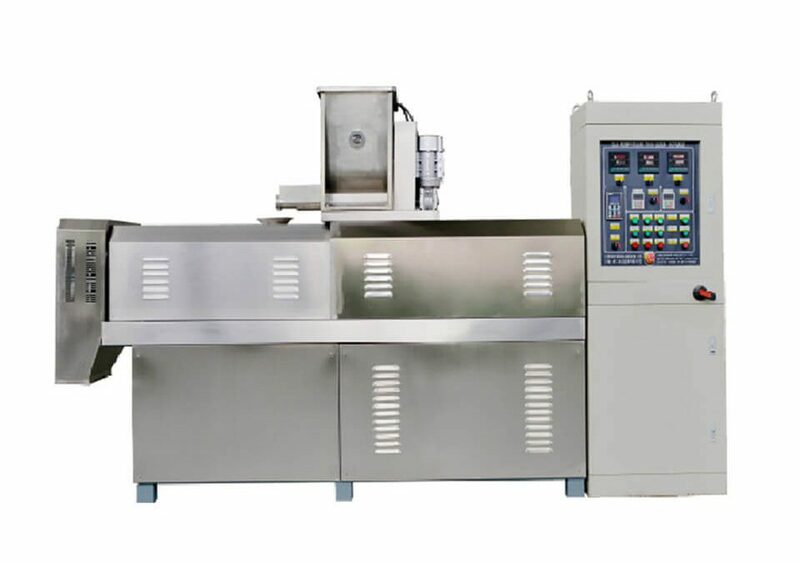 Its main working principle is that the mechanical energy is converted into heat energy, and the food is squeezed and cooked by the heat generated when the machine rotates. The twin screw extruder has two pairs of screws that mesh with each other and rotate in the same direction. They play the role of transport, friction, extrusion, and heating together. 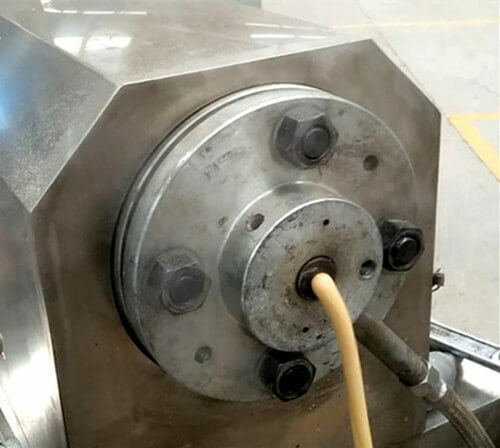 Because the material is inputted by the positive displacement principle, and the forced delivery is carried out, the pressure reflux is rarely formed, the problems on the single screw extruder are solved well, and the strong transportation is carried out. 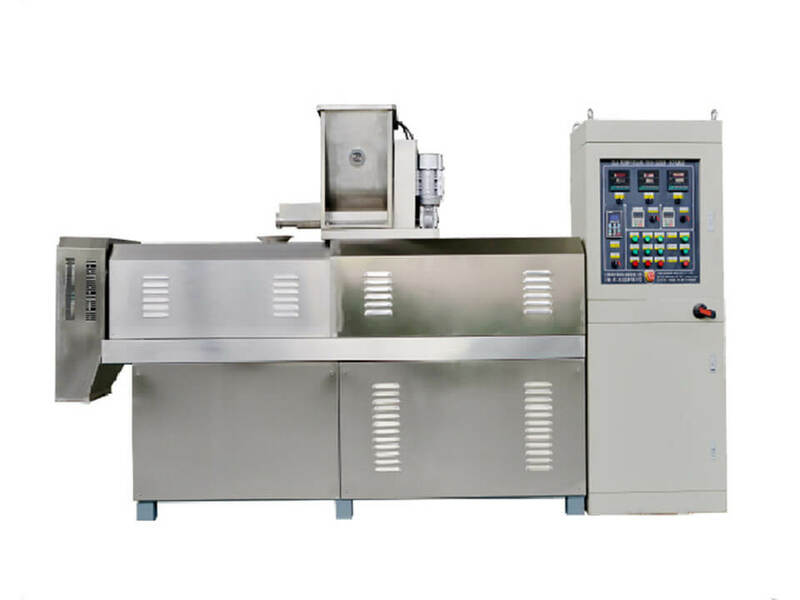 The double screw extruder has many functions such as compressing, mixing, shearing, melting, germicidal, puffing, forming and so on, and these functions can complete in a very short time. The transformation of the mold can transform the shape and size of the product indefinitely. 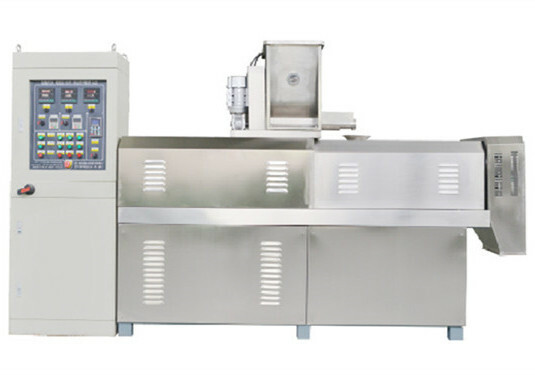 The double screw extrusion machine can produce a variety of food, like snack food, breakfast cereals, sandwich puffed food, instant Rice noodles, soup, bread, textured vegetable protein, candy, flavoring components, and can develop many kinds of new food according to customer requirements. 1. The most typical classic model: It is widely used, low in price and moderate in production, and is very suitable for small and medium enterprises to start their business and use it in a stable period. 2. Commonly used models for tissue plant protein: the capacity is much higher than the classic model. 3. New universal high-volume extruder: it is the most popular machine in the market. 4. The final model is mainly used for the large-scale continuous production of expanded food and pet food. It is the higher end of the market. High efficiency, high production.